It’s March, and you’d think spring would be here by now … but no. It’s -2ºC outside today and flurries of snow are whipping past the window as I type. Had to walk the dogs and do the grocery shop in these conditions earlier … on a bicycle! I don’t know how to drive, so my only mode of transport is the bus or my trusty ‘ol Dutch-made bicycle with a wicker basket on the front. Come rain or sunshine I cycle to the shops every single day for food. Would be nice to have a deep freezer to specifically counter rubbish days like this. Also, you may have noticed I said ‘dogssss‘. 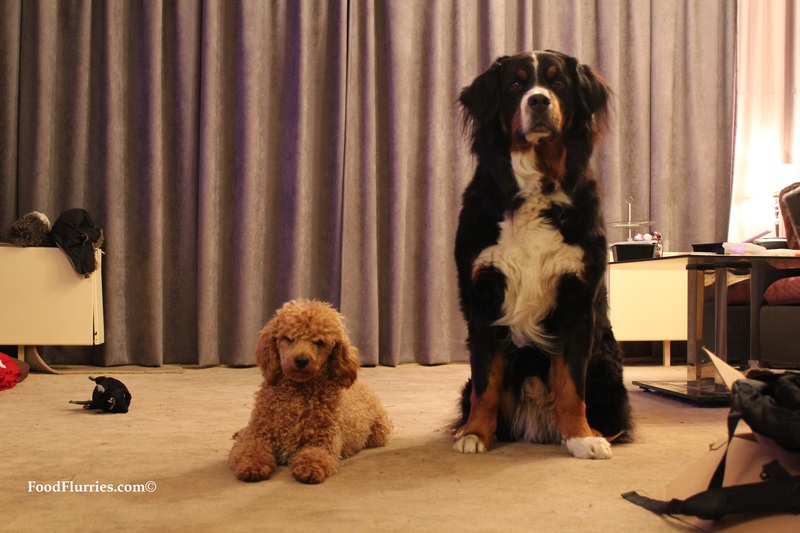 Many of you who know me personally will know that I only have a single pooch, a 4-year old Bernese. The new arrival tho, belongs to a friend who is on a months vacation. His [the dog’s] name is Charlie Brown and he is a 10-month old mini Poodle. Charlie is very boisterous and keeps me busy all day, everyday. My own dog does a pretty good job of ignoring the poor puppy, so Charlie looks around for things to entertain himself with. He has already eaten my headphones and rendered them useless. On the plus side, I have been reunited with lost odd halves of socks from under the bed, thanks to this puppy. Anyway, I digress. Today’s recipe is a warming, thick stew of roasted peppers, onions, tomatoes, cod, prawns and lobster … all served in a crunchy bread bowl. 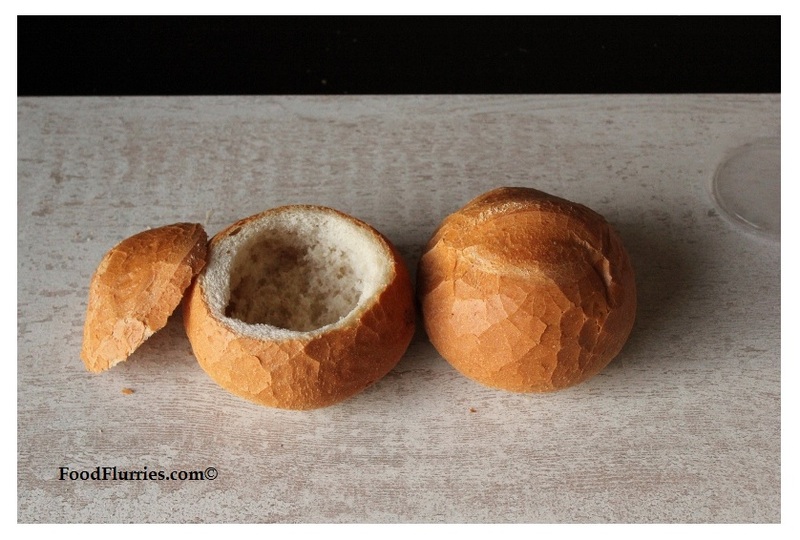 I have always wanted to serve soup this way, but I have never been able to find the proper bread, until recently. Yay! The minute I laid eyes on these babies I got to work on making soup for dinner. My usual safe option would be to make chicken and celery soup (my all time favourite), but R. specifically requested fish stew and I obliged. This recipe does take a bit of time but I think it will be worth your while once you sit down with a bowl of this amazing stew. Begin by gathering your ingredients. Cut up the lobster into pieces. I used a pre-cooked lobster, but raw is probably best. Twist off the claws and cut off the legs. Split the body down the middle so you end up with two halves. Remove the yucky grey and gritty bits (the digestive tract) in the head, then place everything in a roasting pan. 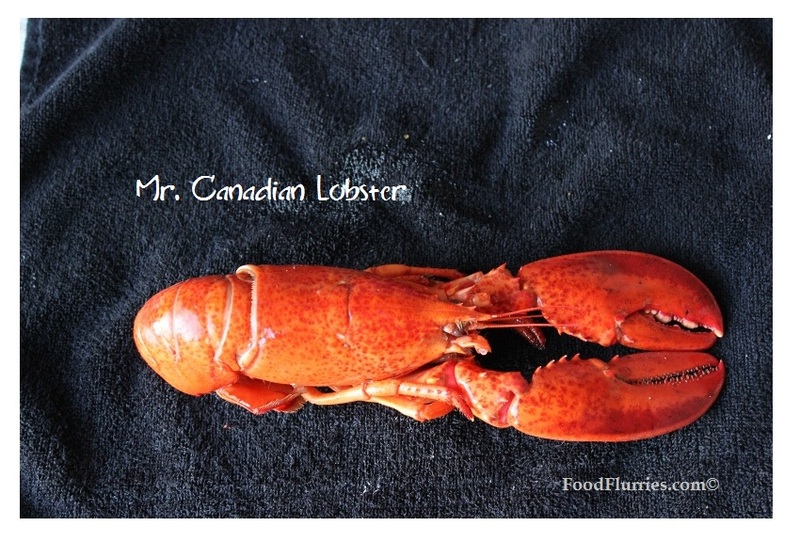 If using a pre-cooked lobster then remove the flesh and roast only the shells. Store lobster meat in a lidded tupperware in the fridge. Add the prawns and roughly chopped veggies into the pan as well. Roast in a 220ºC oven for 15 – 20 minutes until the lobster and prawns are nice and red. The onions, garlic, leeks and red peppers should be nice and fragrant. Remove the lobster pieces and prawns. Set aside in a tray to cool and pick all the flesh from the lobster. Peel off the shells from the prawns. Keep the flesh and save the shells. Tip the veggies into a large stockpot. Deglaze the roasting pan with some fish stock, scraping the bottom, and then pour that into the stockpot as well. Add the wine, canned tomatoes, tomato paste and paprika. Give it a good stir and cook off the alcohol. Add the basil stalks and coriander. Add all the lobster + prawn shells to the pot. Add in the rice and bring up to the boil, then reduce the heat to a low simmer. Cook for 40 mins until the rice completely falls apart … this will be the thickening agent to your soup. During the cooking process if you notice the soup thickening too much, just add more liquid. Forty minutes later turn off the heat and remove the shells. Blitz the soup in a food processor or an immersion blender. Strain the soup thru a sieve to catch any bits of shell that you’ve missed. Pour the strained soup back into the pot and taste for seasonings. Turn the heat back on low and add the fish. I cut the fish into chunks and seasoned it with salt, pepper, paprika and some garlic powder. Completely optional step. 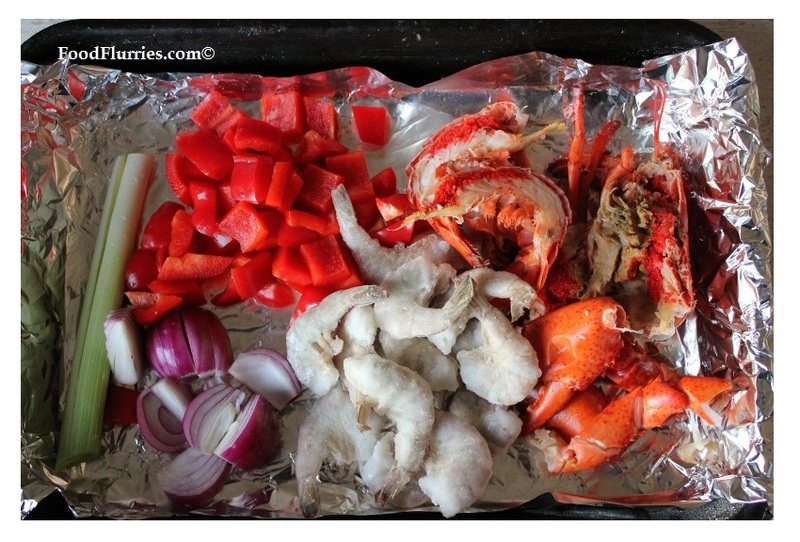 Add the cooked lobster, prawns and raw fish to the soup. There will be enough residual heat in the soup to poach the fish to perfection, so only leave the soup on the heat long enough to heat everything through … about 2 – 3 minutes. 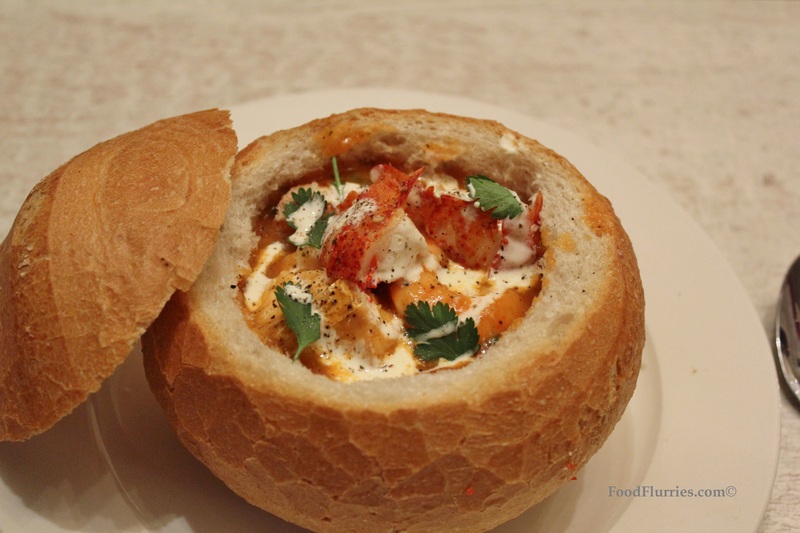 Dish out into bread bowls and garnish with extra coriander, black pepper and a dash of cream. This soup really hit the spot for me today. It had big flavours from the basil, coriander and garlic, with a pinch of heat from the paprika. 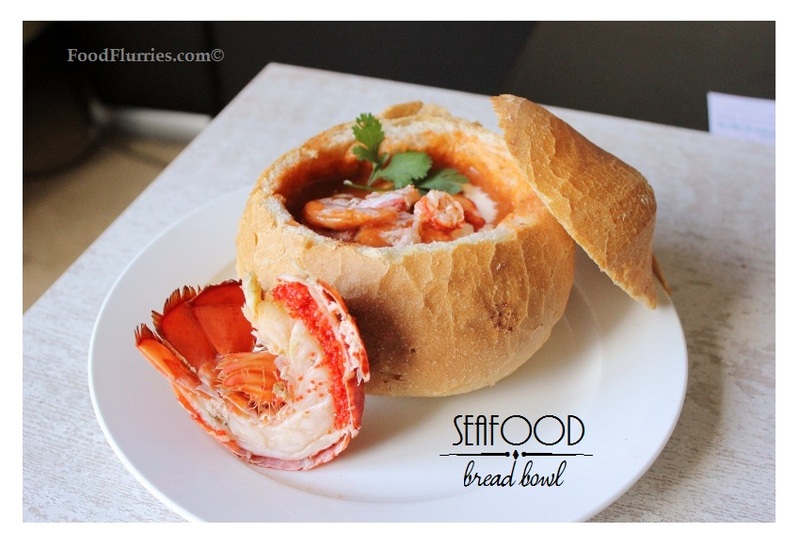 Very hearty, with generous chunks of fish, prawns and lobster tails. If you like, you can include mussles or clams, perhaps even some squid. Either way, this dish would make a wonderful winter meal; just be sure you serve with plenty of crusty bread.